The Stripteaser is a revolutionary line of reflective teaser. 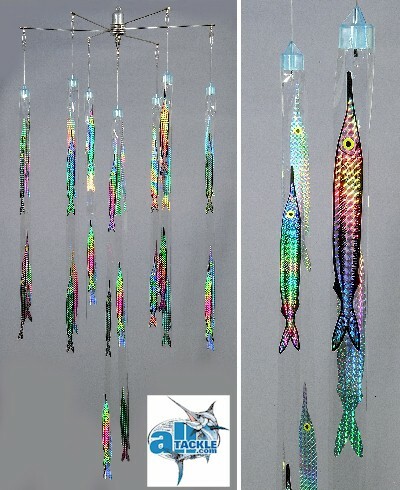 The mylar strips are paired with reflective laminated images of lifelike baitfish. The reflective images reflect a tremendous amount of light. This flickering light attracts all types of pelagic species. Proven to be highly effective on tuna, white marlin, sailfish, dolphin, wahoo and all billfish. The streamer technology so closely imitates a school of baitfish that you'll have trouble telling the difference yourself! 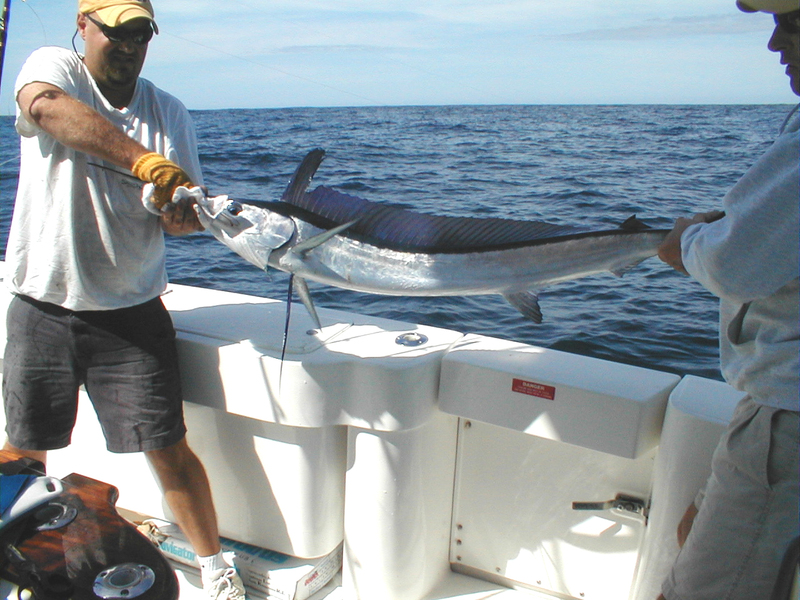 September 25, 2004: Team ALLTACKLE caught and released a rare Spearfish. This fish swam right to the "Baitball" Stripteaser and took a long look. The fish then stabbed and ate the trailing naked ballyhoo. Angler Kevin Lewis reeled the fish to mate Jimmy Gray who wired and gently released the fish after a quick measurement and photo. 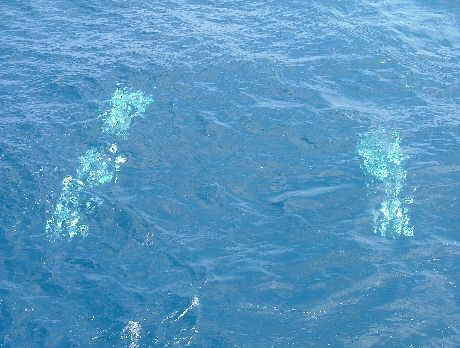 At alltackle.com, we can attest from our personal experience, the Stripteaser is an excellent tool for attracting gamefish to your boat. The Stripteaser can be fished deep or shallow, on a flat line, outrigger, planer, or downrigger. Use it as a teaser or rigged to your own specifications. It's applications are limited only by your imagination. The Stripteaser is made from the most durable materials available and is 100% guaranteed*. 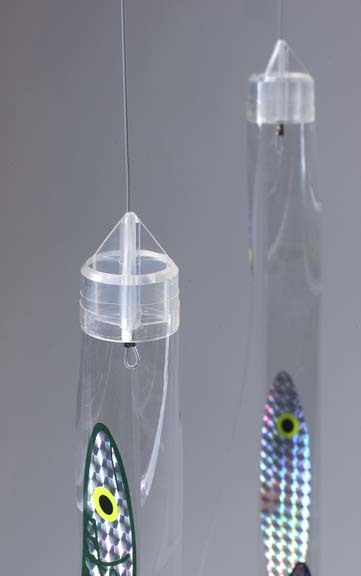 The Stripteaser works by triggering the aggressive instincts of predatory fishes. A 100lb mono leader and snap are included on each individual strip. Current colors are silver holographic scales with your choice of blue or green backs and fins. The 15 fish strip has alternating blue and green fish while the smaller 6's and 9's are all the same color. Each fish has two fluorescent yellow and black eyes. The holographic material reflects an incredibly dazzling "rainbow" of color. Completed "schools" kits are made up by attaching seven to 13 strips with a six arm teaser bar (shown above). 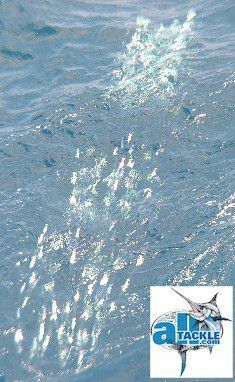 This gives the appearance of a large school of baitfish, right behind the boat. Simply position a rigged naked ballyhoo or other baitfish a few feet behind the school for an effective fish catching presentation. The Fixed 6-Arm Spreader bar is made of .125 inch Spring Tempered Stainless Wire with a 10oz. weight and 28" width. The Collapsible 6-Arm Spreader bars. Note: School Kits include the strips and a spreader bar. An inline weight and a line to connect the School kit to your boat is not included. We recommend a large weight (up to ten pounds) and 400# heavy duty monofilament leader. Fully guaranteed for 30 days against defects in materials and workmanship. Not guaranteed against sharp toothed critters like kingfish, barracuda and wahoo.